Old Salty’s is a popular destination restaurant in lower Dorchester County housed in a renovated old school building. I didn’t know it was rumored to be haunted until I ran into an employee at an event in Cambridge. The employee said it was haunted and that he’d had a few experiences as did his co-workers. So I asked the owner, Jay Newcomb, who admitted he didn’t believe in ghosts but said several of his employees had experienced strange things … voices, crashing sounds, vanishing customers, objects being moved. With Jay’s permission, I interviewed the staff at Old Salty’s and checked the place out myself. According to the staff, there were no paranormal events until a wedding party requested to use the stage for a reception. The renovated school auditorium serves as a banquet hall, but the stage had been closed off and used for storage. This wedding party wanted to use it, so the staff began to move things around, clearing the stage area. The staff claims they’ve heard crashing noises in the banquet hall but when they investigate, nothing is out of order. They can’t find the source of the noise. Mary claims that if she goes into the banquet hall alone, she’ll always hear the ghost call her name. Other employees admittedly won’t go in there alone. Several servers have said they’ll see a woman walk in the front door and go into the dining room and sit down at a table. But when the server brings her a menu, she’s gone. This is odd because there is only one entrance on that end of the building. The woman would have to walk past the server to get to the exit. Kitchen staff told me that shoes, tools, and implements will be moved or relocated to obscure places in the restaurant. Mary, from Hoopers Island and her granddaughter, holds the book, the Haunted Mid-Shore where her story, “Mary’s Ghost” is featured. I took a bus tour into Old Salty’s last year and a few of the guests asked to go into the banquet area. All of them said they felt a strange presence in there. Whether or not Old Salty’s is haunted, the paranormal presence hasn’t deterred customers. It’s one of the most successful restaurants on the Eastern Shore, and known to have the best crabcake in the world. The crab cake is worth the travel 22 miles off Route 50 in Cambridge. It’s made with Maryland back-fin, lump crab meat with almost no fillers. 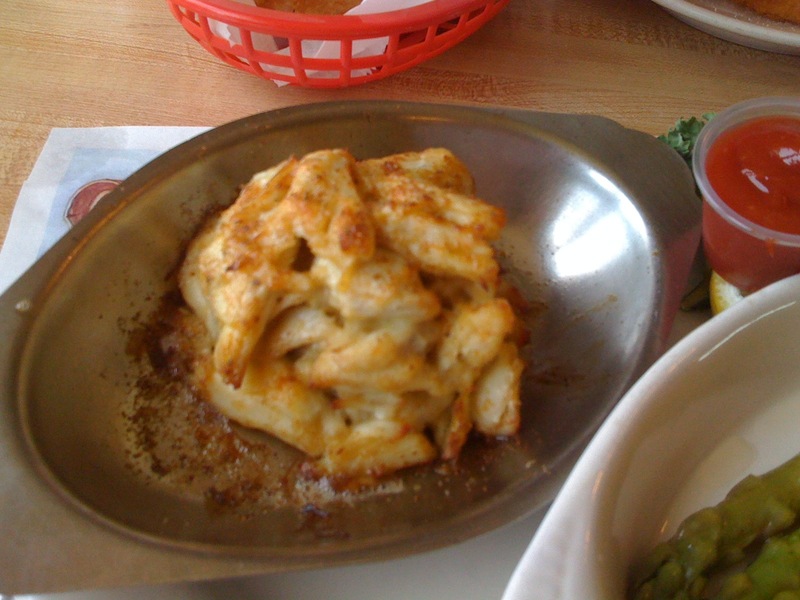 Read more about this awesome crabcake at Find the Perfect Chesapeake Blue Crab Cake. The menu is mostly seafood which is appropriate because Old Salty’s is set smack in the middle of the largest cluster of seafood processing houses in Maryland. The food makes the visit worthwhile, but the ghost(s) adds an extra thrill … if you can sense the presence. I helped my grandmother and grandfather Bill and Mable Cannon clear the place when it was the elementary school. Spent a lot of time mopping the floor, sanding them down in the summer with the old wooden desktops. And I do not remember any ghosts. But I have to say, the food is good and down home on the island. Best crab cakes,I have ever had. I thought Shaffers had the best, but you are No 1#. We enjoyed the trip,it was worth the drive. Sincerely, John White,and Carol.